So the weeknight dinners in our house are forever changed. Forever. This took less than 30 minutes. It was delicious. It had tons of veggies. It was SO easy! I'd seen this kind of thing floating around on the Internets, but I had yet to try it. I don't know why I was waiting. I changed this up quite a bit from all the recipes I found online, but the basic idea stayed the same - all components of the meal are plunked into a big pot and cooked together. It's like a super easy crockpot meal, but in less time than it takes to watch a Seinfeld rerun. Amazing. 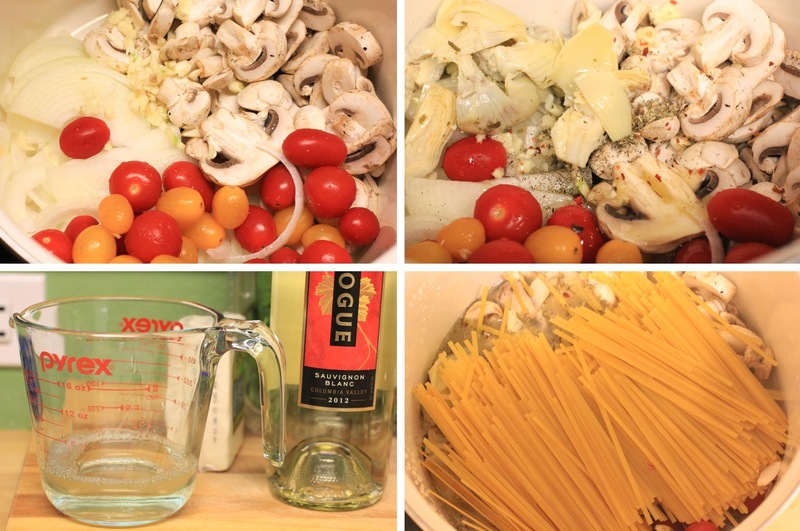 Place sliced onions, mushrooms, cherry tomatoes, garlic, marinated artichoke hearts, pasta, spices, oil, chicken broth, wine and water into a giant pot. With a cover on the pot, let everything boil, stirring a few times to mash everything down and rearrange the ingredients. Turn the flame down to a simmer and replace the lid. While the pot simmers, stir occasionally to keep the noodles from sticking together. 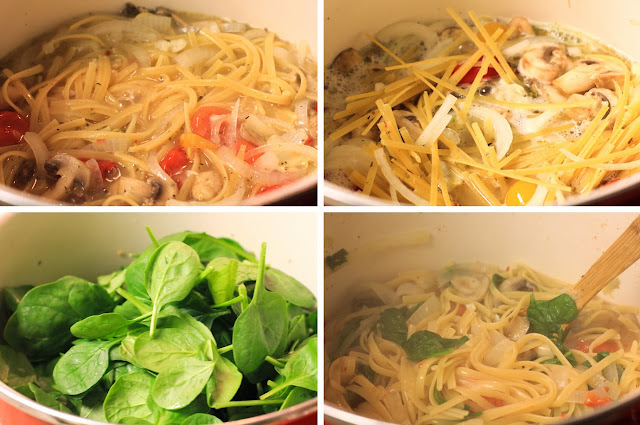 When the noodles are done - about 5 or 6 minutes after the pot boils - put all of the spinach in the pot and stir to wilt and incorporate. 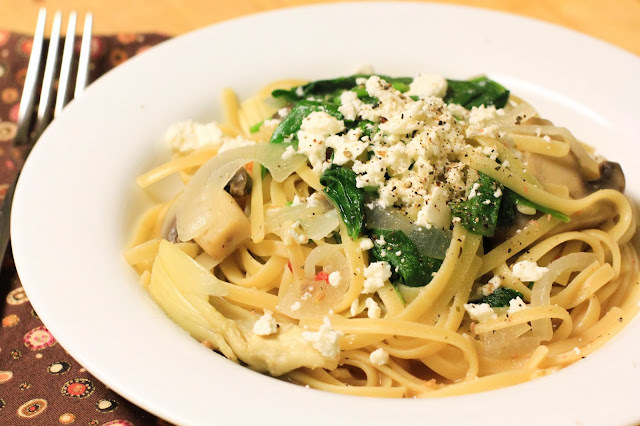 Serve in bowls and top with feta cheese, ground pepper and salt. Enjoy!! I found recipes for this with fewer veggies and more limited variety. I am always looking for ways to up the veggies and up the variety and this was a great one for extra veggies. If you don't like using wine, forget about it. Use another cup of chicken broth or more water. 5 cups of liquid worked well for the amount of veggies and pasta I used. I think this has potential to be a thousand different flavors - kalamata olives, sun-dried tomatoes - pretty much anything I'd want on a pizza sounds good here! 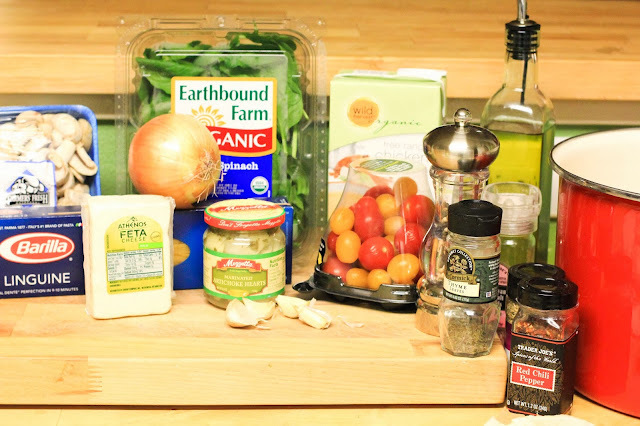 One recipe listed canned, diced tomatoes - that sounds like a great alternative to the cherry tomatoes I used. Hot Chocolate Mix with Dark Chocolate Bits - a perfect gift in a jar!! 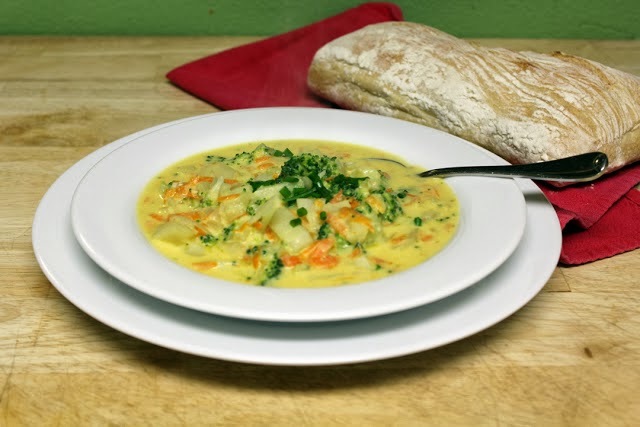 Broccoli and Cheddar Soup - a great meal for a cold night... also a pretty quick dinner.